Wrapping pallets manually with hand stretch film costs time, effort and above all money. As of only five pallets to be packaged per day, acquiring an automatic or semi-automatic pallet wrapper can be worthwhile. Turntable stretch wrappers are often the entry point into the world of automatic stretch wrappers. 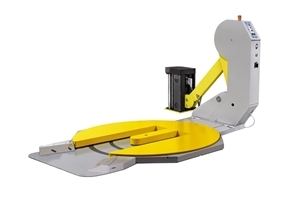 Caution, however: depending on your internal processes and the products you have to package, a mobile stretch robot or rotary arm stretch wrapper might be a better option. But let that be our concern – the eurapack sales staff will advise you comprehensively to find a tailored solution for your packaging processes. The turntable stretch wrappers of the epw610 model series with external film carriage are compact, easy to move and provide numerous setting options to achieve packaging results oriented to customer needs. The pallet wrappers of this model series are equipped with a pre-stretching function. The enables significant savings of stretch film. In an intuitive control panel, pre-programmed film wrapping programs can be selected. Made in Germany, durable, of low maintenance and extremely user-friendly – our turntables of the epw100 model series. The internal film carriage means that all moving parts in the mast are protected. 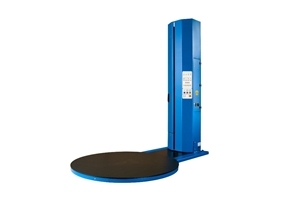 Your requirements determine whether the standard, comfort or film-saving model is the ideal pallet turntable to optimize your packaging processes.